Offering you a complete choice of products which include liquor bottling plants. Liquor Bottling Plants manufactured under the guidance of dexterous professionals by making use of premium quality raw material and ultra-modern methodologies at high-end manufacturing unit. Offered range can avail to clients in various specifications to fulfill various needs. This product is stringently checked by the quality auditors on well defined parameters so as to provide defect free range. Offered range is widely known by the esteemed clients. 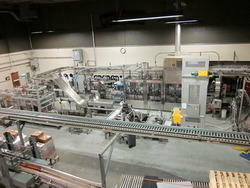 Looking for “Liquor Bottling Plants”?